The following is an excerpt from a currently in-progress novel that imagines a near-future Houston in which natural disaster and economic disparity have gone to new heights. In the shadow of Upper Houston, Bayou City gurgled in a permanent dusk. The Sun, a star of habit, dipped 18 degrees below the horizon, signaling astronomical twilight. Night was settling in, awakening the wetlands. South Texas enjoyed both the allure and the reality of its reputation; harsh, unforgiving, and wild. Everyone that didn’t drown in Lower City knew just how thin the line was between God’s country and the Devil’s yard. Few remembered it from before. They announced in zero-30 the dawn of ascension, where select communities could elevate citizens 15,000 feet above sea level on giant platforms held up by a grid of piers similar to wind towers. Grounded below the platforms of the upper cities, the earthbound became prisoners of rapidly diminishing resources. Drinkable water became a game of hide-and-seek, with most left thirsty. It was now zero-59. Bayou water ebbed and flowed through Lower Houston, becoming the bond that held those left below together. 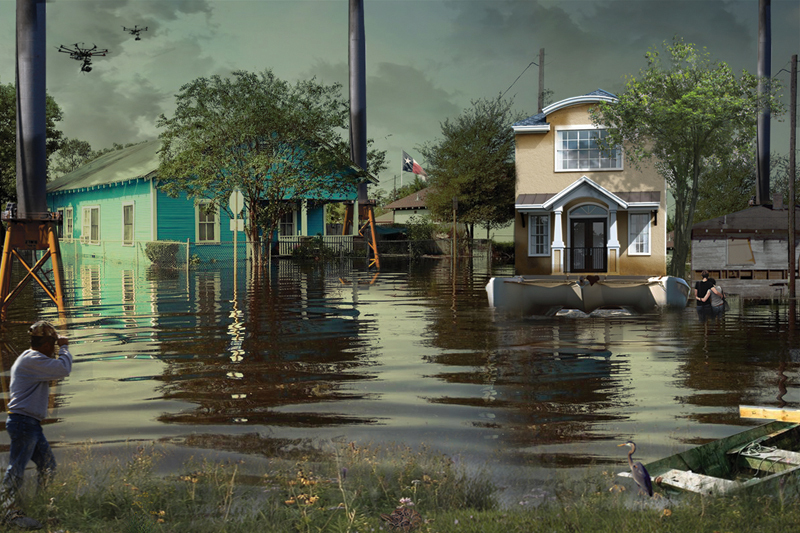 Lower Houstonians lived in a constantly shifting state of pre- and post-flood. Each neighborhood responded according to the solutions of their means, leaving a visible timeline of housing typologies. Older areas with elevated homes built on three- to four-foot concrete piles were rare but historically significant in the once-prosperous areas on the west side, their skirting coated slick with fishbowl-like residue. Some of the luckier institutions like the Menil, Museum of Fine Arts, and Chapel of St. Basil were elevated to Upper City, leaving holes in the urban landscape that quickly became skiff towns for the homeless. To the south, long, wide ranch style homes floated on platforms of buoyant columns and pontoons. These semi-submersible residences gave the owners a certain amount of freedom to move from place to place, and could be ballasted up or down by altering the levels of their buoyancy tanks. Long chain and wire ropes anchored them in place. Architectural engineering firms eked out a living doing underwater maintenance. Entire streets, unable to afford elevation or flotation infrastructure, were peeled into segments and rotted half below sea level. Cheap townhomes throughout the sprawling city shed building materials and chemicals into the floodwaters. Taller buildings in the Med Center, Downtown, and the Galleria opted for a method of containment, sealing off lower floors and creating new entry points. The once-modern principle of connecting inhabitants to nature was no longer viable. Everything was already too close and too raw. Most desired a pristine view of the sky, but it meant moving far from a city center to get it. Out there, it was still the Wild West. Historically speaking, there were numerous outlier events, each marking a step closer to the end of sustainable life on earth. The heat of zero-31 scorched the ground, drying up lakes and tributaries. Fires on the west coast of the United States charred cities and rural zones alike, pushing predator species into backyards. Wildlife everywhere was thirsty. By the mid zero-40s, the public was desperate to find answers in space technology, but the increased pressure only heightened the frequency of explosions and accidents among private sector programs. No one expected Orbital Sciences to succeed, but after quietly joining with the National Aeronautics and Space Administration they left Houston for a facility two klicks off the shore of New Caracas. They needed it. Humans needed space. The wealthy were nervous. Everyone hoped there was a better life somewhere off the planet. Houston lost a primary benefactor when the space program left, but Rice University was prepared. Johnson Space Center, with its miles of asphalt, warehouses, and machinery, became home to the International Earth Venture. Universities from all over the world partnered to research agrobiology, life, ecological and environmental science, engineering, extreme habitat design, and sustainability. Acceptance to the program was restricted to the elite, meaning few participated that weren’t arriving from ascended communities. For many scientists arriving at the storied gates of the IEV campus, it was their first experience on the ground. Not far from the edge of the old highways were the gates to a very different kind of complex: Valero Park. 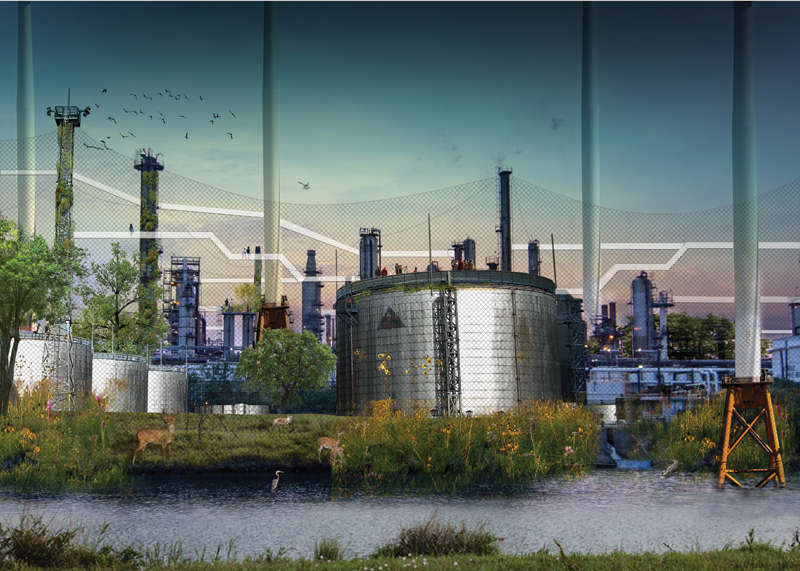 The one-time petrochemical complex was transformed on the notion of rewilding that was popularized by Harvard zoologist Edward O. Wilson and various environmental groups that found their voice in the zero-20s. Principally, rewilded zones were separated from human interaction to allow biological life to regenerate, but that limited human observation of the process. Valero’s parent group, engaged in the rewilding project at its start, tucked tail and finally turned to interplanetary power, leaving room for long-term research into bio-remediation alongside rewilding. 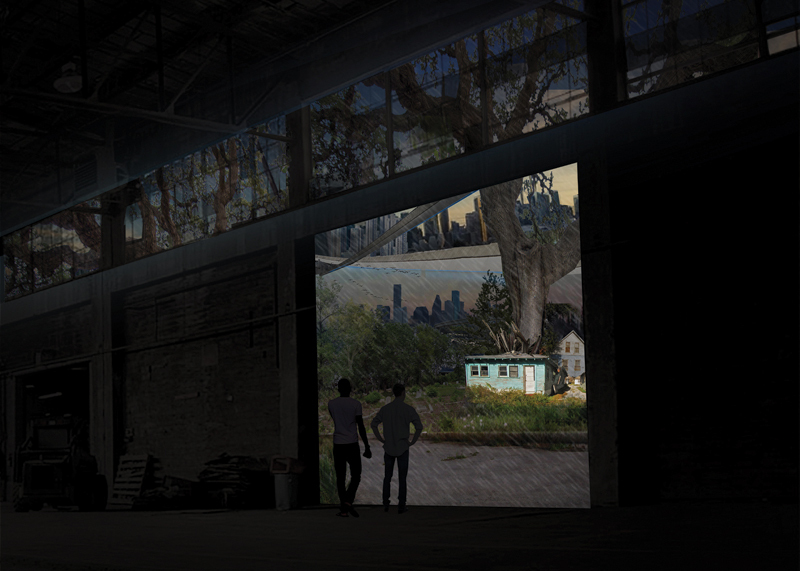 One good thing that came out of the second civil uprising in zero-25 was the resurgence of interest in redeveloping abandoned industrial sites into places where rain could be gathered through pockets in the infrastructure. Before the rebellion, codes didn’t regulate how much rain and sunlight could be blocked by the expanding infrastructure in the sky. Companies quickly swooped in to purchase air rights above old factories and complexes, leasing them back to Lower Houston for tax breaks. Each structure in Valero Park was evacuated of its residual chemical compounds. Over the course of nearly five years, trained environmental teams documented, cleaned, and stabilized the area. Former cafeterias that once fed the complex’s workers became studios for onsite engineers and designers. Bio-remediating plants were spliced with engineered rapid growth genetic doppelgängers cultivated by the IEV. Their success at quickly cleaning Valero Park was widely chronicled and became a standard for regenerative landscape design. “We are now at the leading edge of response to calls for resilience in our grounded communities,” the Houston Chronicle reported. Since the site was located directly adjacent to the ship channel, city mandates asked for proposals that would be flexible for future development. Many of the submissions were for permanent housing for the skiff communities, but Upper City wasn’t interested in bringing those kinds of people any closer to their platforms. Lower Houstonians were just different, the board stated. Aside from housing, the most successful civic designs sought to clean and reuse the site for public good. The most ambitious scheme finally won the commission, resulting in a bio park that began to thrive faster than even the scientists expected. Unbeknownst to the public, the most interesting discovery was a new fungus. News of the finding was buried by media sites more interested in scaring people away from hope. Fear would always sell faster. Two strains of fungus, when introduced to bacteria at the site, colonized polyester polyurethane plastic, causing the material to eventually degrade. IEV was especially interested in developing super varieties that could eat waste plastic humans were bringing to the space stations. Visitors to the park accessed long, metal walkways that laced over and across the high mesh, forming a linear park reminiscent of the Highline in what used to be New York City. The climb up and around the park was arduous, with elevators arriving at designated ramp stations. One reporter called it “an elaborate game of chutes and ladders,” while others saw it for what it was — a giant maze with views across Lower City and out to the grid. The experience of height was still able to capture the hearts of the public in a way that immersive images couldn’t. Novelty was one aspect of climbing through the labyrinth of walkways, but it paled in comparison to the real reason people visited the park. A lily pad-shaped water catchment system delivered rainwater to collectors outside of the mesh. Families gathered in long lines that wound through the wet streets of lower Houston’s East End. They shuffled along in line for hours a day to receive the legal minimum of two liters of drinkable water. The public water infrastructure was privatized to bolster the South Texas economy in the wake of the oil collapse. It left the poor grasping for ways to stay alive, since Houston’s natural precipitation required costly water treatment. The water industry evolved into joint utilities and private securities. Armchair naturalists and students of ecology speculated that the universities and research groups from the IEV maintained hidden entries to Valero Park, which were off limits to the public. “Those entries would have to be underground, and anything below the surface is too unstable to permit construction of passageways,” the IEV operations director argued. “The park,” he continued, “was designed as a time capsule waiting to be opened once the site was ecologically viable.” As each year passed, the dehydrated public lost interest in the park, and the wild grew wilder. Inside, the enclosed park was dank and thick with a briny scent. Sounds creaked and croaked, intermingling with wind pushing through the steel mesh and accompanied by a steady beating. Rhythmic as a heartbeat and more insistent than the heat, something slid its way through the tall grasses. A unique microclimate developed, in which various species thrived. Several years into the Valero Park project, a group of scientists entered the compound to take readings and collect samples. Their trip, scheduled to last only a few hours, dragged into night. Radio communications were cut off by a rapidly approaching tropical storm and flash flood. After three days with no word from the scientists, rescue operations were discussed. Before the rescuers could be deployed, however, two of the scientists returned. Reports of a rash and infected insect bites were released and ignored. One of the surviving scientists didn’t live long, and the other never spoke publicly about the ordeal. IEV and local authorities investigated, but decided not to enter the park in search of the others. It was a “closed loop,” they argued. Around that time, another off-planet explosion was verified, and many were reluctant to revisit the strange, unknown world inside Valero Park. Despite the shadow of the platforms above, the rain seemed to fall sideways, leaving Lower City one step closer to vanishing into the bayou. Plastic snakes of debris lined the slippery, cracked roads, where blocks of houses, their roofs crushed under the weight of time, were reclaimed by unidentifiable species of vine. Vacant lots and abandoned buildings marked the least successful revitalization efforts and became havens for black market activities. Streets were lined with electronic billboards, creating a forest of digital haze selling a way of life that remained foreign to most of the world. One billboard stood above the rest, projecting a real-time Doppler weather radar map alongside flood warnings. For people living grounded, each flood event eroded the edge of their lives inch by inch. Life felt tenuous in the astronomical darkness 18 degrees below the horizon. For decades, upper cities justified their existence, while lower cities decayed. Only a few media sites tried to remain objective, searching for ways to unify the growing policy divide. This was not a story of cities, but of how nature could take as much as she gave. The struggle felt by every resident above and below was more than a fight for resources or human rights; it was a grenade, waiting for the right amount of pressure to go off. In the final days before the end of cities, the journey begins. Jessica Deaver, Assoc. AIA, is a design associate at Nick Deaver Architect. She lives in Austin and Houston.